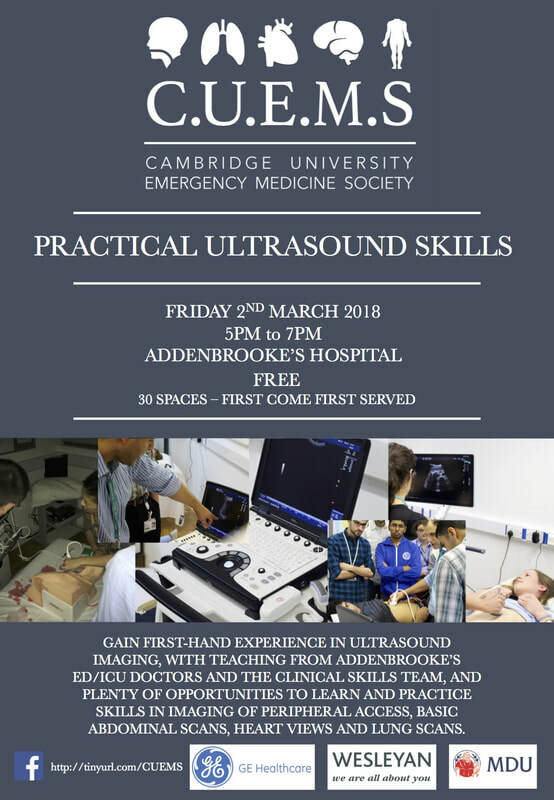 Gain first-hand experience in ultrasound imaging, with teaching from Addenbrooke’s ed/icu doctors and the clinical skills team, and plenty of opportunities to learn and practice skills in imaging of peripheral access, basic abdominal scans, heart views and lung scans. This event will be running in two sessions, one at 4.30 to 6pm, and one from 5.50 to 7pm. If you can no longer make the event please email cubluelightsociety@gmail.com so we can allocate your space to someone else! The highlight of the CUEMS year: the National Battlefield and Pre-hospital trauma conference! This is a must for anyone with an interest in emergency medicine, where you alternate between learning 5 of the critical skills needed in an emergency, and working as a team to manage a patient through 5 high fidelity trauma scenarios. The skills you will learn range from massive hemorrhage control to practicing cricothyroidotomy on animal tracheas, whilst the trauma scenarios could be anything from gunshot wounds to road traffic collisions. There will also be the opportunity to discuss prospective medical careers in the Army. Overall, an unmissable event with plenty of exciting events and learning opportunities! 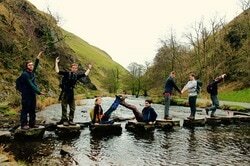 For the second trip this year, CUWMS will be exploring the Peak District! Promising biscuits, beautiful hikes, and the occasional SCENARIO! Scenarios are simulated medical or non-medical emergencies that you could potentially encounter on an expedition, as a doctor or expedition leader. They may happen anywhere and especially ANYTIME throughout the trip. Whether you're experienced or have never been involved in simulation training, you will have scheduled fun and hopefully learn a lot. Wherever you are in your medical training, this trip is suitable for you! The estimated cost is between £40-50 (food, transport and accommodation). We will confirm exact monies when we send emails allocating spaces on the trip - there are 14 spaces available. This Cambridge University Pre-Hospital Care Programme academic forum is focused on Chest Trauma, a critical part of prehospital emergency medicine. There will be discussion on traumatic chest injuries, pathophysiology of injuries, and key aspects of management. The keynote speaker will be given by Dr Adam Chesters, EM and PHEM consultant, and a second lecture by Dan Cody, critical care paramedic and examiner for the IBTPHEM DipIMC exam! No tickets required - just turn up, all are welcome! The lecture theatre seats the first 90 to arrive. A livestream will be available for those unable to attend in person and self-certified CPD is available for all participants. 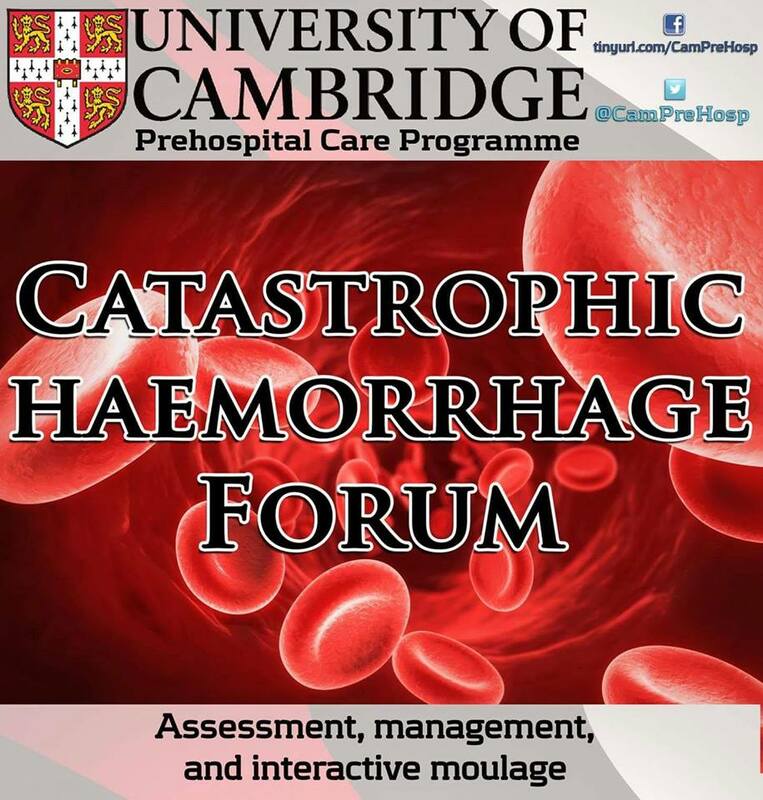 The January Cambridge University Pre-Hospital Care Programme forum is focused on the management of Catastrophic Haemorrhage. The keynote speaker will be given by Erica Ley, who is 'Air Ambulance Paramedic Of The Year'. It promises to be an amazing talk! This event is certified for 1 CPD point with the Royal College of Emergency Medicine. This event is free and all are welcome! Drinks afterwards for those interested. The third Cambridge University Wilderness Medicine Society trip of the academic year is a great way to start the easter holidays! As always it offers a great mix of the great outdoors (which should hopefully be a bit less cold), cosy nights in and most importantly -SCENARIOS! A winter Cambridge University Wilderness Medicine Society trip is a great way to finish the term before the holidays. As always it offers a great mix of the great outdoors, cosy nights in the bunkhouse (with central heating!) and most importantly -SCENARIOS! 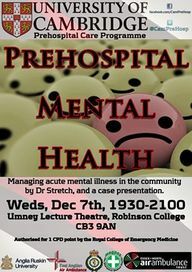 This forum by the Cambridge University Pre-Hospital Care Programme will focus on managing acute mental illness in a pre-hospital environment, with a case discussion to illustrate some key points. Dr Stretch will be the keynote speaker. It promises to be a great event! The highlight of the CUEMS calendar the national Battlefield and Pre-hospital trauma conference is a must for anyone with an interest in emergency medicine. During this immersive day of emergency medicine you alternate between learning 5 of the critical skills that my be needed in an emergency and working as a team to manage a patient through 5 high fidelity trauma scenarios. The skills you will learn range from massive hemorrhage control to practicing cricothyroidotomy on animal tracheas. The trauma scenarios could be anything from gunshot wounds to Road Traffic Collisions. An exciting event which will teach you lots - you can't miss it! There will also be the opportunity to discuss prospective medical careers in the Army. 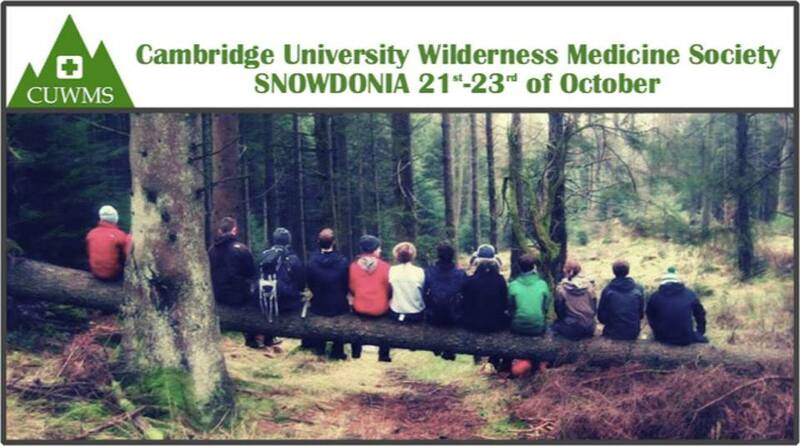 The first Cambridge University Wilderness Medicine Society trip of the academic year. This time their going to Snowdonia! A sure way to give you a great mid-term break head off into the hills for walks through amazing countryside, cozy log fires and some amazing wilderness medicine scenarios! The October forum of the Cambridge University Pre-Hospital Care Programme will focus on traumatic brain injury in the pre-hospital environment. It promises to be a great talk! A great introduction to some of the basics of emergency medicine, which are important for everyone - no matter what specialty they have in mind. 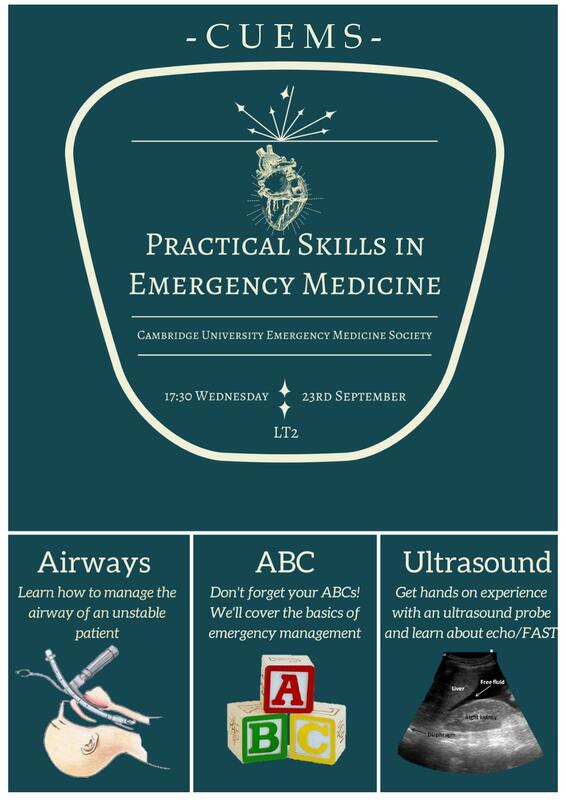 This session will offer an introduction to the core ABC's which are applied to every emergency, let you practice using airway aids and learn when each is appropriate and give you the chance to get your hands on an ultrasound machine (a rare opportunity for a medical student). A great way for new year 4 students to end the intro weeks! Cambridge University Pre-Hospital Care Programme's next forum is on how major incidents are managed by those on the both of the ground and in the control room. This talk will give an amazing insight into the decisions that have to be taken to ensure the emergency services can do 'the most for the most'. Dr Adam Chesters will be giving the keynote lecture and Gaynor Wareham will run a exercise to show how triage is applied in such incidents. This event is free and all are welcome (medical or otherwise)! Drinks afterwards for those interested. ﻿A unique opportunity where students gained hands-on experience with ultrasound, led by Dr. Kendall (ED consultant and head of clinical skills) facilitated by ED/ICU doctors. This was made possible with thanks to GE healthcare providing numerous ultrasound devices (from hand-hend to widescreen). Practical stations included both diagnostic ultrasound (focused ECHO, IVC and fluid status, FAST, chest) and procedural ultrasound (peripheral and central IV access). Cambridge University Pre-Hospital Care Programme's next forum takes place on Tuesday 26th January 2016 from 1930-2100. 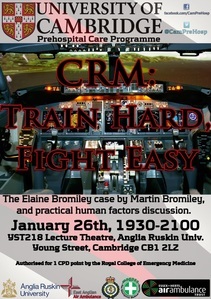 Martin Bromiley will be delivering the keynote lecture, and this will be followed by a human factors discussion by Lucy Mitchell, a former police officer and a psychologist who is now Addenbrooke's Human Factors Specialist. This is a big topic that affects all aspects of caring for patients so we're hoping to see you there! All welcome, medical or otherwise! These forums are free to attend and are certified for one CPD point with the RCEM. Parking lots are at Adam and Eve Street (free for two hours) & the Grafton (not free, sorry!). Drinks afterwards at the Tram Depot for those interested. Tickets not required - event is free and you just turn up on the evening. Lecture hall seats 150. Some of us are fascinated by the intricacies of the mind, whilst others seek the adrenaline of dealing with fast paced emergencies. But how can these two interests be combined? Join us for a talk by Dr David Christmas on his work in Trauma Liasion Psychiatry. Especially relevant to all those with an interest in trauma or psych, the talk will be followed by a Q&A session. The CUEMS National Trauma Conference - the highlight of the CUEMS calendar. With practical skills stations ranging from chest drain insertion in pig thoraces to massive haemorrhage control, and trauma scenarios ranging from motorbike accidents to improvised explosive devices, this conference is set to raise the bar for trauma conferences around the country. Don't miss out on what will be an invaluable learning experience. ﻿Cambridge University Pre-Hospital Care Programme presents its November forum on: Sedation and Anaesthesia, the bread and butter of prehospital medicine. A RCEM accredited forum, this event is being delivered by Magpas Helimedix and will include a keynote lecture, an interactive moulage (with student volunteers! ), and an open discussion of prehospital anaesthesia and sedation. This event is certified for 1 CPD point with the Royal College of Emergency Medicine. 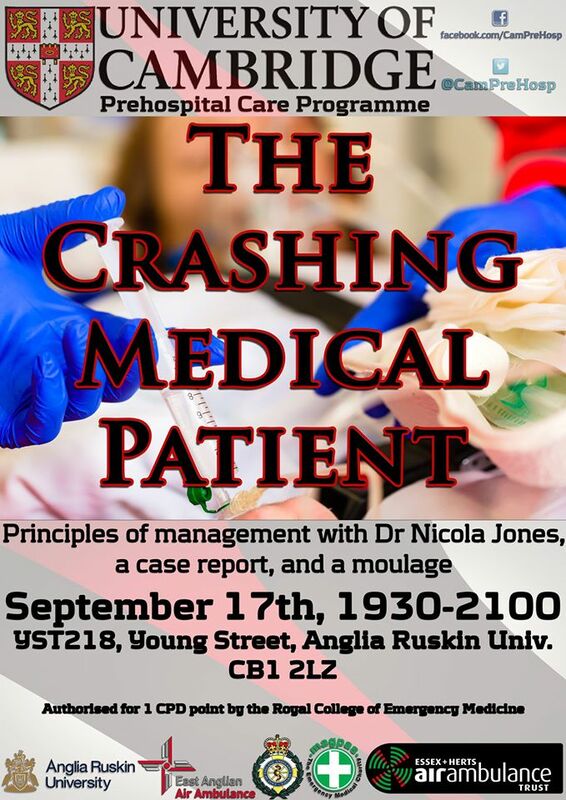 ﻿Cambridge University Pre-Hospital Care Programme presents its October forum on: The Crashing Medical Patient. 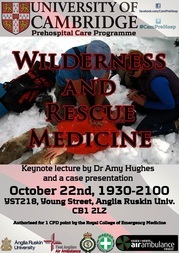 A RCEM accredited forum, this event focuses on wilderness and prehospital rescue medicine with a keynote lecture delivered by Dr Amy Hughes. This will be followed up by a case discussion and interactive Q&A. A fascinating series of short talks from final year medical students. A must for anyone thinking of doing an elective or SSC in emergency medicine. 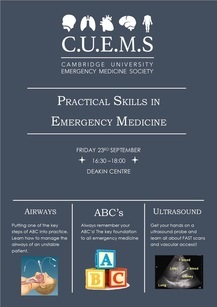 The first ever Cambridge University Emergency Medicine Society event. This is not one to be missed, with exciting hands-on practical stations covering airway management, ultrasound in emergency medicine, and the ABC approach to the trauma patient.